I love astronomy since childhood and astrophotography is a new hobby for me when i bought my first telescope: a Newtonian Skywatcher 150/750 on a Neq3-2 mount. The mount has no GoTo and no Autoguiding, but has only a right ascension motor. I read a lot of comments and reviews of people saying that with that mount it’ll not be possible to do Astrophotography of the Deep Sky because it’s not designed for that and because it’s a light mount and it can’t handle the Skywatcher 150/750. The scope weights 4.5 Kilogram and the mount has a maximum load of 5 Kilogram. So if i add the finder scope and the camera the total weight will exceeds the maximum capacity of the mount. And in astrophotography there’s a rule that the total weight of astrophotography equipment (telescope + adapter + camera + filters + finderscope) shouldn’t exceed 70% of the maximum load of the mount. So in my case it’s clear that I’m at 100%. But with a precise and good balance, I was able to achieve a perfect stability of my astrophotography equipment and after a well polar alignment. I succeeded to photograph the beauty of the Deep Sky. Of course it’s not possible to pose longer than 60 seconds with no Autoguiding. But even so, I had very detailed and sharp images Star clusters, Open clusters, Galaxies and Nebula. For some objects of the Deep Sky, poses of 30 seconds were sufficient to obtain a good result. 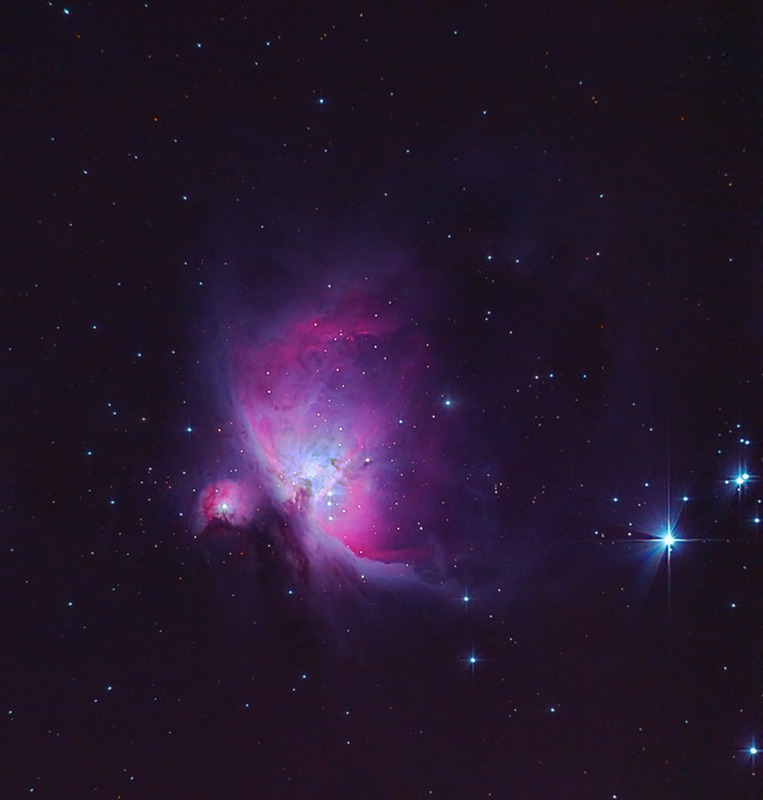 You can see these images of the Orion Nebula (M42) of The Great Hercule Cluster (M13). Both of them were captured with a 30” seconds of pose. You can see how much detail I obtained. The Skywatcher Telescope 150/750 is certainly the best beginner telescope for those who want to learn and start astrophotography. It’s easy to use, easy to collimate and the time required to cool the scope is very short compared to other telescopes like the Maksutov or Schimdt-Cassegrain. Some of my pictures were selected and published in a famous Magazine, Facebook and Twitter pages. For planetary imaging it’s best to have an astrophotography camera that means a dedicated camera for imaging the planets like ASI or ATIK. They are very sensitive and can capture a huge number of frames per seconds. But for my case I’m actually using a modified Webcam (Logitech C270). With a Barlow I had an excellent result on Jupiter, Mars, Saturn and the moon and its craters. I hope that you’ll find in this website all the informations you need to have the best of your equipment.